For the past 19 weeks and 11 canyons I have been eating and rappelling for two. David and I are having a baby. This past Monday as the temperature climbed over 105 degrees in Phoenix, David, Cam and I escaped the heat and headed for Christopher Creek. I needed this trip knowing it would be my last canyon adventure for the foreseeable future. Pretty soon I will be too big for my wetsuit and clumsy with my new shape. Prudence says I keep the harness in the closet for now. Shortly into the canyon we came across a group of three adults and four kids making their way down the first significant drop-off. The smallest youngster in the group was only 4- years- old! The adults were lowering the children down the 25- foot fall. After all the children were safely and successfully lowered down the drop we heard them cheer in unison, “Daddy! Daddy!” as their father rappelled to join them. We then watched the four- year old clad with a life vest cling to her father’s back as he swam across a long pool heading down canyon. David and I could not have been more excited to see them and get a sneak peek as to what is possible with even the youngest of kids! The day was all I had hoped it would be with the sun shining and mellow swimming through temperate water. This was also Cam’s debut canyon and he rocked it. Yet again, David and I had another happy camper at the end of their first technical canyoneering adventure. So for now I will be taking a break as an author on this blog, but I will most certainly be back and hopefully one day there will be a new regular in the group. Cam makes his way down canyon. Cam treads water at the bottom of a rappel. DAVID/LAURA: Congratulations! I know Erroll and Liz are looking forward to the new arrival. You are going to be such a great mother and your future child is going to be so lucky to have parents who will take him/her on these amazing adventures. I can’t wait! Hi David & Laura, Family adventures rock! It is so awesome that you got so many canyons in before you hung up your wetsuit in pursuit of your newest adventure. My wife and I have some great memories doing Salome one spring when she was six months pregnant. Congratulations, your going to love being parents with so many adventures to share. I am the “Daddy” you refer to in this blog post. 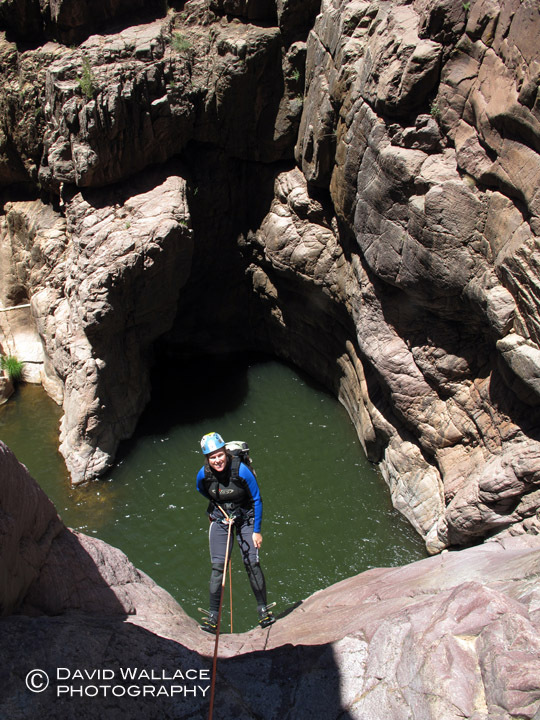 It was so nice to meet you and feel your excitement in seeing a family canyoneering together. The kids had such a great time. It took us a little over seven hours, which is pretty good with two four year olds and two six year olds. I love your blog and the pictures are stunning. If you every want to team up for a family adventure we’d love to share one with you. I was part of that “family expidition” as well. That little 4 year old was my daughter. It was fabulous to share such a moment with another excited couple as well. On my first canyon I was 5 months pregnant. Words of advice…make sure you have some serious upper body strength when you choose to canyoneer with a 4 year old! She did great, but part of the time I had to use her as a “human walker”! Her little legs decided they were “done” and I would hoist her by her body harness, move her forward a bit, and then step forward myself. Hardest, but most satisfying, workout of my life! You’ll love parenthood. No two days are alike!